As a matter of fact, I did not know her. Some of my close friends did. They hung out together and helped each other but I never actually met Kateryna Handziuk. I only heard about her. Now that she’s dead, she will become a new line in Ukraine’s history. Her name will be mentioned next to Georgiy Gongadze’s, she will be remembered at demonstrations and in international reports — and she will be used as a meme. From what I know about her, I don’t think Kateryna would be especially thrilled about any of this. She was a class act: sincere, fiery, kind, impatient with dirt, open, sharp, truly learned, and smart. A true Ukrainian woman of the 21stcentury. 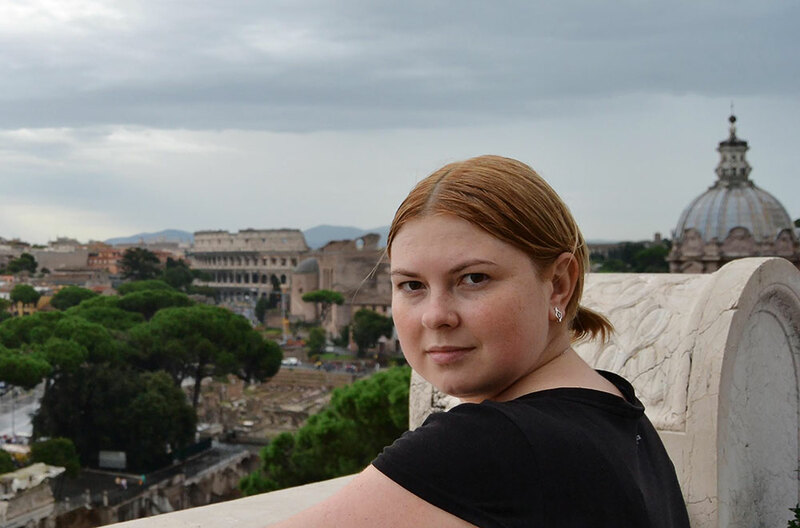 Today, there’s probably no one in Ukraine who hasn’t heard about Kateryna Handziuk. But I will note, pro forma: on July 31, this 33 year-old veteran of both Maidans, one-time employee of international organizations, active volunteer, graduate student at the National Academy of Public Administration, and, most recently, acting general administrator on Kherson City Council and assistant to the Mayor, that is, an influential civil servant in the region, was attacked in the most vicious manner. Someone threw sulfuric acid right in her face. This is not the same as being beaten or even shot. It’s much more personal, more brutal, cruder to burn the face of a pretty woman. Nor was that all. Fully one third of Kateryna’s body was burned. She underwent several operations, but after three months, her body simply could not take any more. A blood clot in the heart and death. And so an attack presumably intended to frighten ended up being a murder. The local police responded without enthusiasm initially — at least that’s what it looked like from the outside. They quickly found a scapegoat with a criminal record who was easy to pin the crime on. If not the shock that the incident raised, it’s very likely that everything would have ended at that. But Kateryna herself was such a shining light, so visible and popular, and the crime so heinous, that the community was seriously enraged. The Prosecutor General took charge of the investigation and the SBU was called in. At this point, stories about what happened next diverge. One version is that the police quickly made amends and began to work almost ideally: interrogated hundreds of witnesses, found recordings on a security camera, collected evidence, put together the entire chain of events and caught the perpetrators red-handed — with traces of acid burns. Well, the fact that they stubbornly refuse to finger whoever ordered the attack — we aren’t in Russia, so torture is forbidden, so we’re going to have to wait awhile for God knows what. The opposite version, law enforcement officers deliberately delayed the investigation because Kateryna had personally waged a long war with the local police and with local corrupt elements — and in a small oblast center, everything seems to be so interlinked… There is one thread that comes up very little in the searches and speculations: Handziuk fought stubbornly with “vatnik” emissaries in Kherson, and they, in turn, were tied to that same police… which, thinking of the Donbas, was nothing surprising. At this point Russia’s hand naturally casts a shadow… only evidence is short. Meanwhile, the tragic death of a heroine — and if anyone deserves that name, Kateryna Handziuk does — raised a new wave of outrage across the country, with rallies, furious discussions in social nets, debriefings in the Rada and political vultures attaching themselves to protests — none of this makes it easier to establish the truth and punish the guilty. The parallel with Gongadze calls for picking up the torch and inevitably brings to mind the “Ukraine without Kuchma” movement. Still, there is a difference, and a substantial one. The meeting points may not be so obvious, but public opinion, through inertia, begins to put the blame on those in power for everything, not just for the delays or sabotage but, in the nature of protest emotions, well nigh for the murder itself. But this time there’s no all-powerful president who suggested getting rid of the pesky journalist who was playing on his nerves. There was no ambitious interior minister and no direct subordinates — tonton macoute operating with impunity. There were some not-exactly-skilled and very unprofessional guys who had come back from the front. There was the organizer and the mysterious backer whose tracks originated either in Kyiv or in Moscow. Time marches on. We’re all used to the fact that there’s us and there’s them. “Us” is those who stood on the Maidan and demanded a reboot for the country. “Them” are those who represent the hated regime, under-lustrated political oligarchs who changed hats and keep soaking the country. Now it we’re finding out that “them” and “us” have been mixed together, class feelings no longer work, and things are a lot more complicated. Plenty of decent folks have joined the government who were around before, but now they aren’t the exception but a phenomenon. But among the activists, there are also those whose consciences are not working full time — nor, if I can be forgiven, their brains. A very delicate if not painful aspect is the fact that those who carried out the attack were veterans who were unable to find themselves in civilian life again after the war. Where Tornado was seen as something exceptional and random, now more and more Ukrainians understand that the boys whom we keep thanking for our freedom are not automatically angels, and as long as there is little to no rehabilitation on a national scale, they will be drawn to both light and dark deeds. The police? It’s well-known that the reform, which can more accurately be described as the establishment of a one-and-only “showcase” department from scratch, did nothing to alter the foundations of motivation and the principles of the work of this sick agency. Lustration proved to be a laughable simulation that only proved that business as usual was not only possible but even necessary, and nothing would happen to anyone anyway. What’s more, in the run-up to elections, no one wants the situation in the country to get out of control. The showy demarche of the Prosecutor General, who was perhaps the only one recently to demonstrate that he is not hanging on to his seat for dear life, simply emphasizes, with its non-standard approach, the eternal truth that those in power don’t give up their own. The country has to be under control, because of elections, because of war, because of sabotage, because of comebacks... The fact that, in some sense or in certain areas, the comeback has already taken place bothers only those who have been cursed, like Kateryna. My point is not that there is no difference between the Yanukovych regime and the country run by Poroshenko — on the contrary! A lot of mafias is always better than a single one. Targeted reforms or declarative ones are still better than their deliberate absence. Activists inside the system are better than if they’re out in the back 40. However, support from the government when there’s a hybrid war with an aggressor cannot be based on “Don’t rock the boat.” Because without pressure, this machine will not work. Kateryna Handziuk’s death has not been in vain. She proved that getting justice served can and must be the goal, that this challenge is not a hopeless task. She showed us the sick parts once again. Clearly, this is a matter of honor for all those involved, and the guilty will be found. I believe this for some reason. I only hope that it will not have to happen at such a high price again.